WASHINGTON (Sputnik) - US Secretary of State Mike Pompeo in a telephone call with Ukrainian President Petro Poroshenko has urged Kiev to fulfill outstanding International Monetary Fund (IMF) requirements, State Department spokesperson Heather Nauert said in a press release. "The Secretary welcomed Ukraine’s recent passage of anti-corruption court legislation and the Law on National Security and urged Ukraine to fulfill the outstanding IMF requirements," Nauert said on Tuesday. Pompeo also stressed that the United States has not and will never recognize Russia's attempted annexation of Crimea, Nauert said, reaffirming US support for Ukraine's sovereignty. Establishing an anti-corruption court has been one of the IMF’s main requirements to grant Ukraine another line of credit. 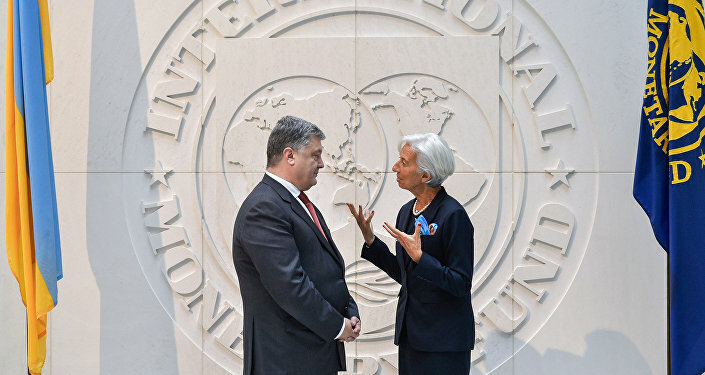 The IMF's four-year aid program under the Extended Fund Facility has allocated $17.5 billion for Ukraine. Ukraine has already received four credit payments and expected to receive a fifth in December, but the fifth tranche wasn't delivered because Kiev has failed to meet all IMF requirements.